“What does it mean to be human?” The answer lies within the mystery of Genesis. Set in a postapocalyptic future, the novel takes the form of an examination undergone by young Anaximander as she prepares to enter an enigmatic institution known simply as The Academy. For her subject she has chosen the life of the philosopher-soldier Adam Forde, her long-dead hero. It is through Anax’s presentation and her answers to persistent questioning by her examiners that we learn the history of her island Republic, along with the rules and beliefs of their society. For her subject she has chosen the life of the philosopher-soldier Adam Forde, her long-dead hero. It is through Anax’s presentation and her answers to persistent questioning by her examiners that we learn the history of her island Republic, along with the rules and beliefs of their society. At the completion of the examination, when everything has been laid bare, Anax must confront the Republic’s last great secret, her own surprising link to Adam Forde, and the horrifying truth about her world. Read Anax’s account of the events that bring us from the present to the time she is living in (pp. 5–6). What, from our point in time, would have to happen — or not happen — to bring about this future? What, in this projection, relates to our current fears? “The only thing the population had to fear, was fear itself. The true danger humanity faced during this period was the shrinking of its own spirit” (p. 6). Although Genesis is a book about the future, its roots are in today’s world. How does the quotation relate to our own society? If the statement is true, what can be done to combat this? Anaximander speaks of the human spirit and its blackening by fear and superstition. Superstition is defined as “the need to view the world in terms of simple cause and effect.” This in turn leads to the hunt for monsters and the rise of conspiracy theories. Do you agree that conspiracy theories are the desire to create a narrative we can understand out of events we do not understand? 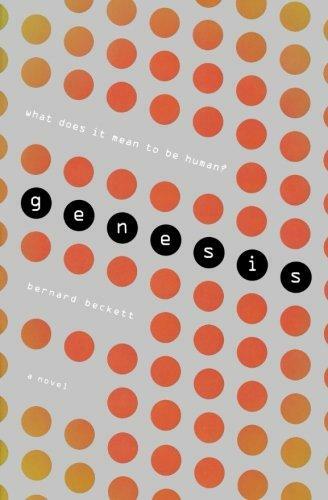 Does Bernard Beckett rely on superstition and conspiracy theories in his novel, or does Genesis attempt to break away from these? In the novel, Plato’s five great threats to order are Impurity of Breeding, Impurity of Thought, Indulgence of the Individual, Commerce, and The Outsider. Can you think of other organizations/philosophies in which these ideas have appeared before? Are there instances in history when these ideas have been feared/abhorred? Can you find a parallel in our recent history? “I believe those who feel the urge to understand Adam’s heroism instinctively understand the importance of empathy. For a society to function successfully perhaps there needs to be a level of empathy that cannot be corrupted” (p. 32). Adam’s actions were, by his and Anax’s accounts, the result of empathy. Yet this, for all he knew, put his nation at the risk of plague. This raises questions about the greater good, actions that may be abhorrent but necessary, and the instinctive human reaction. Are we still human if we lose this empathy? Or is the ability to put this aside what makes us human? Is it possible to have a level of empathy that is incorruptible? Can you think of any real-life examples of this? How convincing is Art’s theory about the Idea (pp. 98–99)? What does this imply for humanity? For any “thinking creature”? Reread Adam’s speech about what it is to be human (p. 100). What is the essence of his argument? What might you add to his argument, or how might you define it differently? Reread Art’s argument about the soul (p. 111). Is this willing ignorance the thing that makes us human? What Art is describing seems to be one of the main tenets of most religions, though Art claims this idea is present in all humanity’s thought systems, including reason and the ideas of Darwin. Is there any belief system that doesn’t incorporate the idea of a soul and its relationship to eternity? Do you agree with Art’s reasoning of why this is so central to humanity’s beliefs about itself? Awareness of our mortality is given as one of the key differences between human and artificial intelligence. How does this awareness of mortality influence the way we think about ourselves and our lives? Which do you think pushes the boundaries of our ideas of ethics and morality further, artificial fertility treatment programs or artificial intelligence research? What are the sorts of ethical questions each field of science raises? Consider the ideas of the Greek philosophers Plato and Aristotle, whose namesakes feature in Genesis. How do their works relate to ideas found in Beckett’s novel? If you’ve read Mary Shelley’s Frankenstein, which is often called the first science fiction novel, what connections can you see between Genesis and that nineteenth-century gothic work? Have the major questions Genesis raises changed much since the industrial revolution? If so, how? Revisit the first chapter of the Bible. How does Beckett’s novel compare and contrast to the Old Testament story of man’s creation? What genesis is taking place in the novel, and at one point did you realize what it is?